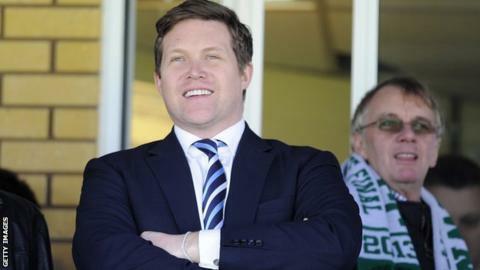 Leeds United managing director David Haigh has resigned from the Championship club's board the day after Massimo Cellino completed his takeover. Haigh, who had been set to become chief executive following Cellino's takeover, had been on the board since GFH took over at Elland Road in December 2012. He attempted to take charge of the club through his Sport Capital consortium but the deal collapsed in January. Leeds are currently 16th in the table after five straight defeats. Haigh said in a statement: "Owing to various statements made by and on behalf of the new majority owners of Leeds United FC, I am left with no alternative than to resign as managing director of the club. "This is a matter of particular regret to me since I was the person who first introduced Eleonora Sport (Cellino's company) to the club's owners. I also gave them my full and constant support in the Football League's lengthy approval process. "I am not yet, due to confidentiality obligations, in a position fully to respond to various statements which have been made about me over recent months. As soon as I am I will address the various issues - obviously a great deal has happened these past two years. "As is well known by those in or close to the club, my unstinting support of Leeds United throughout my time at the club has extended to loaning the club money to ensure that tax, players and staff were paid and to underpin its continuing viability - loans which to this day remain in the club." His departure comes on the day that West Yorkshire Police confirmed they were "investigating allegations of funds being misappropriated for the purchase of technical equipment". There is no suggestion that the two events are linked. Head of crime for Leeds, Det Supt Pat Twiggs said the investigation, which is believed to involve payment for unauthorised hidden cameras, had started after a report was made by the Championship club on Wednesday. He added: "Enquiries are at an early stage and we are not in a position to give any further information about the nature of the allegation."